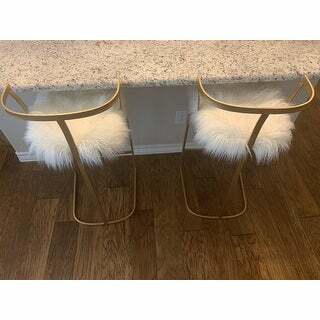 These stools are so girly and so nice and fluffy I love them ,I also got a white dining set from here and they match with it perfectly ..they look so sheek and everyone loves them ! 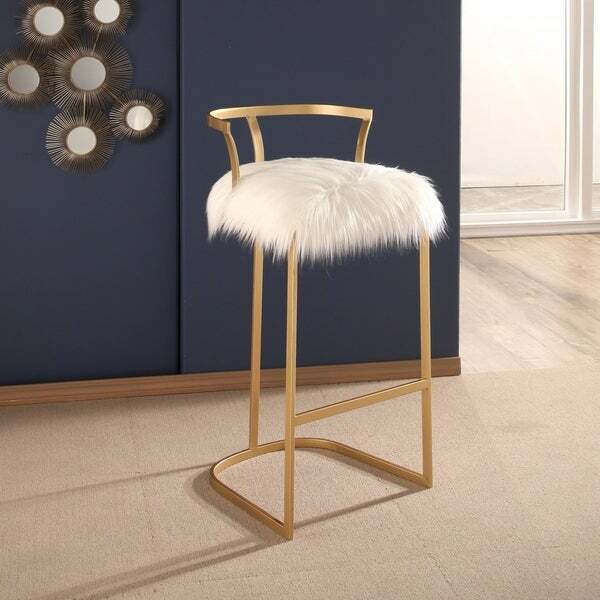 Adorn your space with unforgettable glamour with this decadent bar stool. A fluffy white cushion floats atop an eye-catching gold base for a touch of glitz and elegance you are bound to love. The description says the stool is 30 inches tall — that’s the height of the seat, not the stool. It won’t fit in my space. The gold paint is also in poor condition in places, though the fur seat itself would be pretty fabulous on a different stool! I expected the gold color to be a bright shiny yellow toned gold, but it looks more like a spray painted dull bronzy gold. Also, fyi the fur cushions are not removable. Overall cute lightweight chairs though. This was exactly what I needed to complete my makeup station! Very sturdy, great quality, & very stylish! I highly recommend! I would recommend getting scotch spray to shield it from stains. This is a beauty! I bought this for the makeup station at my salon and they are beautiful! Very chic and expensive looking. Sturdy for clients and they add elegance and conversation to the room. Everyone loves them! I love these barstools. They’re a lot of fun and have a nice matte gold finished frame that goes around it. The fur seats have a playful quality to them and they look great in any Staged space we have done. Here is a photo of what they look like in action! I bought this for my girlfriends vanity and she absolutely loves it ! 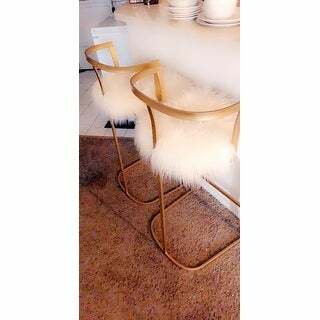 We searched everywhere for a gold and white stool such as this but this one exceeded what we were looking for ! Extremely comfortable and worth every penny! 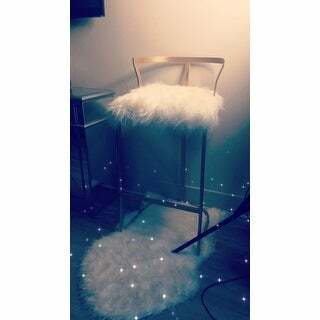 I love these stools! The fur is kind of silky and soft not cheap looking or feeling. The gold is pretty, matte, not shiny brass, but I’m putting them near my dining room table that has a shiny brass base and they look great together. The weight of the chair is not as heavy as I anticipated but they feel solid and sturdy for sitting. I’d recommend😁! 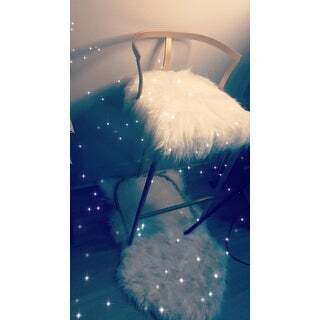 This is a darling stool! The brushed Gold is perfect and the fur on the seat does not look cheap. It’s not a high back for support at all and it can be tipped over easily. I wouldn’t recommend using it on tile or wood. It’s best on Carpet so it doesn’t slip, especially if you have kids. These come assembled and are very comfortable and stylish! as pictured, heavy enough to look more upscale. Fur is easily fluffed. This is the best purchase ever. 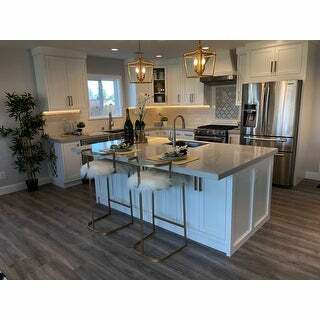 Looks very elegant and classy, refreshes the look of the kitchen. It little tall to actually sit and eat on it though. it was too tall for our island. Delivery was quick and the chairs are light weight and easy to move and unpack. No assembly necessary and most of all BEAUTIFUL!!! Soft and stunning!!!! So fun & beautiful! They are very light weight but not a big deal. Very comfortable and a great conversation starter. Unique and had some flare to a room. "What does the bottom side/underneath look like? Since the cushion isn’t removable, I’m curious if it could be cut out in the future when they are so worn and replaced with another cushion just sitting atop the metal seat." There’s a dustcover on the bottom of the piece. "I need 2 of these bar stools but it states only 1 left. When do you restock?" Stock should be available in November. "The description says 30 inches but the specifications on full details say 38 inches. Which one is it? If 38 inches, what height table are you supposed to pair these with?" The height is about 30 inches. "Does that mean that you will not be restocking?" New inventory will arrive in August. "When will this be available for restock?" "Is this still on schedule for a late April or early May re-stock ?" The estimated re-stock date for this item is late April or early May.